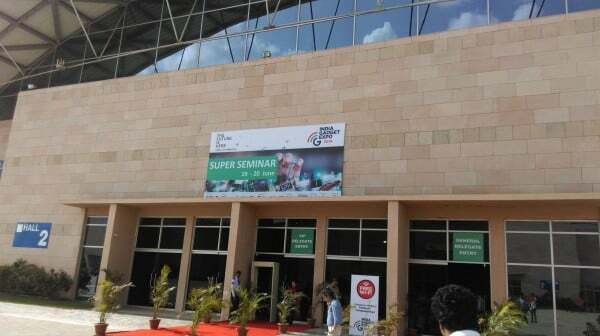 The India Gadget Expo 2014 was being held in Hyderabad for the first time and the TelecomTalk team was present at the event to cover it. Here are the important updates from Day 1 of the event. 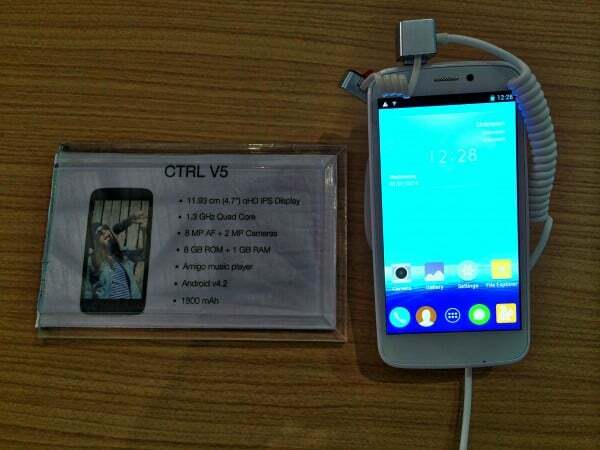 – Gionee will update Elife E7 Mini, Elife S5.5 and CTRL V5 to Android 4.4 KitKat by next month. But they don’t have any defined plans to update the Elife E7 to Android 4.4 KitKat anytime soon. – Gionee is working on better UI and software. They also discussed about the stock Android UI and a plan to give users an option to remove their customisations for a stock Android UI like experience. They will also come up with 7 or more regional languages in their smartphones. – Gionee will launch a complete range of 4G LTE smartphones next year. All these smartphones will be compatible with 4G LTE (2300 MHz) networks in India. – Gionee doesn’t have any plans to launch tablet devices. – Gionee showed some interest in smart watches category because they are said to be a good companion for smartphones. – According to Arvind Vohra, Gionee is the 10th largest smartphone brand. He also thinks that, smartphones will eat up tablet and PC market eventually. 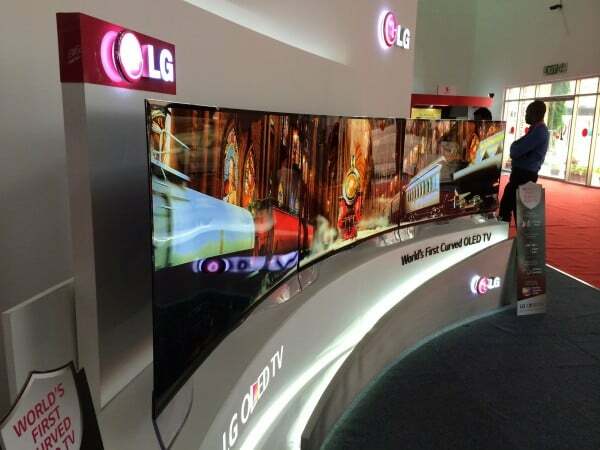 LG focussed on showcasing a complete range of new Smart TVs in the India Gadget Expo 2014. The star at the LG’s booth was LG 65UB980T is a 4K LED Smart TV which will be priced at around Rs 4,00,000 in India. It comes with an IPS panel, MagicMotion remote control, 4.2 Channel Harmon Kardon speakers and is powered by WebOS. If you remember WebOS was developed for touch screen based smartphones and tablet devices by Palm which was acquired by HP. Later, LG acquired it to use it in their Smart TVs. It also showcased its curved OLED Cinema 3D Smart TVs, 55EA9800 and 55EA9700 which are priced at Rs 9,99,000 and Rs 5,99,000 respectively. 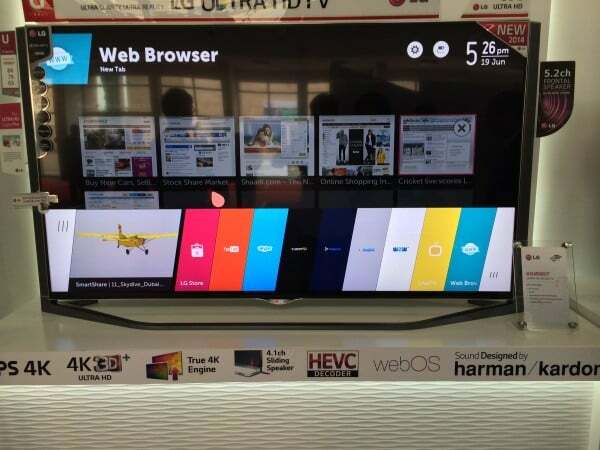 Apart from the Smart TVs, LG also showcased its smartphones such as LG G2, LG G Flex and LG Nexus 5 at the booth. The LG X-Boom CM9730 music system was also presented during the expo. It has an ability to output 25000 watts PMPO of sound and is Bluetooth compatible. It also has some unique features such as Smart DJ and Auto EQ. 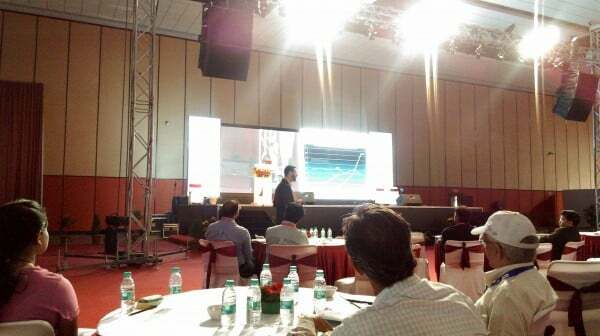 LG, during its keynote, announced that it will bring more 4G LTE smartphones in India by the end of 2014. Levi Shapiro is a partner at TMT (Technology, Media & Telecom) and is also a professor at the IDC Media Innovation Lab. He discussed about the future of smartphones during the presentation. He stressed about the IM Chat Apps like WhatsApp, WeChat, KakaoTalk, Snapchat, etc which are taking the mobile apps world by storm. He stated that India still needs to improve is data network for better experience in smartphone apps. According to him, more than half of the users in Korea use 4G LTE networks. He also revealed some numbers about Indian smartphone market share of OEMs in Q1 2014.